Birthday: 9th of Winter, 493 A.V. 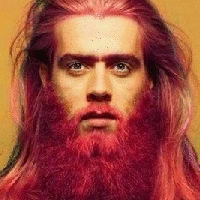 He has very long strawberry blonde hair that he colors pink with dye made from rosehips. His skin is pale, but he has many beauty marks and moles spotted across his body. His eyes are pale blue and peek through a very hairy face. He is slender and light on his feet. He is shy, effeminate and somewhat self-centered. He suffers from severe depression and is prone to fits of rage. Every week he dedicates an entire day to proper bathing and self-reflection. He is friendly, yet formal when he communicates with strangers. He is soft-spoken until he lets his guard down or when he gets angry. Glofrithu's maternal grandmother is Vantha, but he took after his father. As a result of his mother being half Vantha, he can speak Vani. His mother has three older sisters and they often visited him as a child. His aunts are rather intimidating Vantha women and they enjoyed teasing and tricking him. These tricks included the use of magic. At first he was not sure what to think, but they soon intrigued him and eventually initiated him into the art of shielding. He picked up auristics naturally and intuitively, but did not pursue it as much. His father has no interest in magic, being an honest and hard-working man. He raised him to be polite and courteous, contrary to his aunts. In his youth he focused on the arts and bonded with his mother through this. He was often marked as being woman-like by his peers. One day he started having strange nightmares. He thought to reach out to the god Nysel, for dreams are his domain, but when he did this, he had a terrible vision and was cursed with overwhelming despair. In this moment of darkness he was bathed in a warm light. He believes that it was the goddess Priskil and as a result he feels drawn towards the watchtowers of Aquiras, as well as the cultures prior to the Valterrian. Last edited by Glofrithu Baldrson on September 21st, 2018, 1:10 pm, edited 20 times in total. 1 SP Socks A pair of cotton socks. 1 SP Leggings A pair of cotton leggings. 1 SP Shirt A cotton long-sleeve shirt. 1 156TK Pants A large pair of white, llama wool pants with yellow, green and blue floral and avian patterns. 1 136TK Coat A large hooded, peach, llama wool trenchcoat with orange and yellow epaulets and wood buttons. 1 36TK Boots A pair of rose ochre winter boots with fleece lining inside. 1 SP Heirloom A hand-mirror made with seashells. 1 SP Comb A fine comb made of wood. 1 SP Brush A thick brush made of wood. 1 SP Soap A bar of soap made from vegetable oil. 1 SP Razor A foldable straight razor with a wooden handle. 1 SP Knife A foldable pocket knife with a wooden handle. 1 SP Flint A piece of sharp flint. 1 SP Steel A steel fire striker. 7 SP Rations A bag of assorted food rations. 1 SP Pants A pair of light-blue cotton pants. 1 SP Cloak A light-blue cloak made of cotton. 1 SP Shoes A pair of shoes. 1 50 TK Rosehip An ounce of rosehip extract. 1 7 TK Oats A pound of dried oats. 1 1 TK Honey A pint of honey. 1 1 TK Milk A gallon of milk. 1 1 TK Butter A pound of butter. 1 1 TK Eggs A dozen eggs. 1 1 TK Yeast A pound of yeast. 1 30 TK Flour A pound of wheat flour. Last edited by Glofrithu Baldrson on September 25th, 2018, 9:37 pm, edited 15 times in total.